Within ancient and modern spiritual traditions, the Dance is metaphor for life, an ancient choreography moving with the rhythm of the Earth to the music of the cosmos. Within Celtic tradition the Ceilidh is a gathering, a celebration of music, storytelling and dance. The long winter nights are passed to the music of the fiddle, whistle, the beat of the bodhran drum. 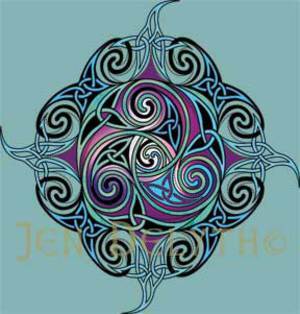 The traditional Celtic dances weave intricate patterns of circles, spirals, squares in arrangements of threes and fours - a dynamic expression of the eternal knot. In ritual dances such as the annual Beltaine Maypole dance, men and women weave ribbons in ancient spiral patterns around the phallic tree to raise and manifest the fertile earth energies. The Morris Dancers continue the tradition of the Shaman dances. They wear antler headdresses and costumes of red and white representing the colors of the Otherworld. Their clogs, sticks and bells stamp out rhythms in circle and square patterns on the earth in celebration of the ancient Horned God of fertility and strength. The Lord of the Dance is one of the oldest Gods of the Natural World. Within the Christian religion, he is still honored as the force at the center of our spiritual and metaphysical lives.